The Third Session of Parliament (Winter Session 2014) ended on 23rd Dec 2014. The 16th Lok Sabha commenced its business on 4th June 2014. Till the end of Winter Session, the Parliament functioned for 55 days. The Lok Sabha functioned smoothly and worked for 98% of the scheduled time. The Rajya Sabha functioned for only 59% of the scheduled time due to disruptions by the opposition parties. The Question Hour was more productive in the Lok Sabha than in the Rajya Sabha. A higher percentage of questions were answered in this session than in any other session in the past ten years. How to assess the performance of MPs? Generally, the performance of the members can be assessed by their participation in the debates, in raising questions, in the introduction of private members bills and in their attendance. The cumulative performance of the Tamil Nadu MPs from the beginning of the first session till the end of third session (4.6.2014 to 23.12.2014) was analysed. Our analysis is based on the data released by the PRS Legislative Research (www.prsindia.org). Out of 39 Members elected from Tamil Nadu, one Member Shri Pon Radhakrishnan is a Minister of State. Ministers do not sign attendance and do not participate in debates and ask questions. Hence, he is excluded from this analysis. National Average for the entire 16th Lok Sabha (three sessions) is 8.8 debates per member. Tamil Nadu has scored 8.5 debates per member. Shri P R Subramanim (Namakkal), Mr M Thambidurai (Karur) and Mr V Elumalai (Arani) have topped among the Tamil Nadu Members by participating in 16 debates each. Private Members Bills provide an opportunity to individual members to introduce any bill individually, without the permission of their respective parties. There have been instances where private bills have been accepted by the Government for introduction as a regular bill. Even if the bill is not accepted, a detailed debate is allowed on the subject. A total of 129 Private Members Bills have been introduced by 40 Members till the end of the winter session. Unfortunately, none of the Tamil Nadu Members have introduced any Private Members Bill in these three sessions. Probably because that 37 out of 39 Members belong to a single party (AIADMK), they do not want to take risk. The party leadership can encourage the Members to introduce Private Members Bills in the interest of the public. This is an important tool in the hands of MPs allowed in the Parliament procedures. A total of 18,989 Questions (including supplementary questions) have been raised by all the Members in Lok Sabha and replied by the Government till the end of the winter session. Average for Tamil Nadu is 38 questions per member. 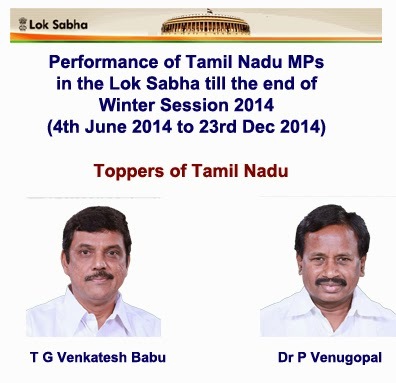 Mr T G Venkatesh Babu (Chennai North) is the topper among Tamil Nadu MPs. In all the three Sessions, he has raised 146 Questions. During this Winter Session 2014 alone, he has raised 75 questions of national and state importance. He has secured 100% attendance in all the three sessions. He is also the overall topper among Tamil Nadu MPs with a total score of 159. He was a topper even in the earlier sessions also. Mr P Venugopal (Tiruvallur) secures second position among Tamil Nadu Members raising 128 Questions in all the three sessions. He has raised 60 questions during this Winter Session 2014 alone. He secures second position in the overall tally by securing 140 points. He has taken up issues of national and state importance. Out of 38 MPs (excluding one Minister), 19 MPs have secured 100% attendance. The Average attendance of all the Members for Tami Nadu is 94%, the highest among all the States. The National Average is 85%. The overall performance score (debates + private members bills + questions) of Tamil Nadu is 43.5. Although Tamil Nadu MPs have been attending the sessions regularly, their overall score is far below the national average of 47.1. Also when we analyse the contents of the debates and questions of all the MPs, we find that all the members take up only state level or national level issues. They do not take up the constituency or district level issues. Prime Minister Narendra Modi has been advising all the MPs to take up the micro level issues of their constituencies in the Parliament, so that the Government can take up such issues. The large contingents of MPs belonging to the same party AIADMK and most of them are new MPs. AIADMK party should take initiatives to provide adequate training to their new MPs about the functions of the Parliament, so that they can compete with other Members at national level. · *Ministers do not participate in debates, raise questions or introduce private members bills after they become Ministers. They do not sign attendance.